Personality: Timid and introverted. Is lonely but independent, and can easily survive on her own. She is socially inept since she has spent most of her life living alone. She never does things without a cause, but is open to help those in need. Fractera wants friends, however her lack of social skill seems to hold her back. She doesn't usually run into other Dragons, and if she did, she will probably try to avoid them. Is interested in humans and lesser species, and has a habit of stalking (although not often). Fractera does not despise humans, and treats them as if they are a lower rank of creatures. She is a collector of lost items, even though she doesn't have a place to put them. When confronted, will try to seem submissive to avoid conflict. However, she can be aggressive should anything/anyone upset her. Fears: [b]She fears deep waters and enclosed spaces (claustrophobia). Strengths: Scavenging, has an extremely strong sense of smell. Surprisingly, she can fight very viciously, but will try not to unless it is needed. 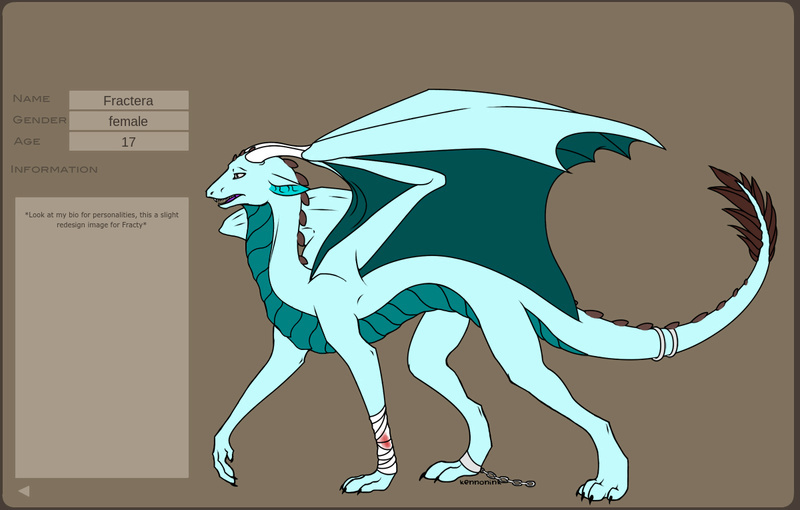 Appearance: A slender, light blue fur dragon with white long antlers. Thick dark brown fur at the tip of her tail. Teal colored plated belly scales. Medium sized rigid brown back scales. She has large wings with a dark blue webbing. Has 6 limbs; a bit like a Wyvern but with two front legs (pretty much the picture above, except the picture does not have claws on the wings). Wears a bloody bandage on her front left ankle due to injuring it while scavenging. Has a broken chain on her back right ankle after being captured a year ago. Two silver tail rings. Mother: Sharyen died drowning in an ice lake. Father: Tundrid lives away in the snowy mountains. Hatchmates: Has no known siblings. Special Abilities:A light frost breath (like an icy smoke-bomb fog), ice blast (very powerful. Travels at a speed of 80kph. A blast of ice that has a knockback on the user when used). Combat Style: Will pounce and try to hold down her opponent. [b]During combat, her best tactic is to dodge and strike from behind. Has great maneuverability, and with the plus of her slender body, can move quickly. Will use kicks and aggressive biting and occasionally uses her tail as a whip. Uses her special abilities more than physical attacks. History: Had a Mother, but was attacked by humans when Fractera was a hatchling (read Memories In Between Us). Moved out of her Father's cave when she turned 12. RP Sample: Fractera slid down the hill, scraping her feet. She winced in pain and clutched them tightly. "Argh.. that hurt" she mumbled. She decided to continue exploring and brushed aside the trees and bushes in her way. Fractera stopped walking and stood still. Was that.. voices? She attempted to hide herself and peeked through the clearing of trees. There were two hatchlings playing with each other. Fractera silently walked away and thought it would be best to leave them be. "Special Abilities: During heat strokes, she has vague visions of the future." So long as this is for story purposes only I'll allow it. I'm a little confused though is this a dragon or a chimera? It doesn't sound anything like a dragon and we don't have chimeras. Oh, Fractera isn't a chimera, just dragon with a thin fur coat (is that allowed..?). I've seen dragons with a bit feathers, so I thought of throwing in a bit of feathers in her wings. And if you're confused about the 'six limbs' thing, I meant sort of like a wyvern but with front legs too. Yes, the heat strokes thing is for story purposes. But I doubt it will be used as much in roleplay. "A slender, light blue fur dragon with dark brown antlers. Has furry fox-like ears with pink flesh insides. Ear droop to the sides of her face. 4 thick white stripes on her tail with a blade of thick brown fur at the tip of her tail. Teal colored plated belly scales. Medium sized smooth teal back scales. A mix of feather and webbed wings. Feather layer is dark brown and webbed layer is teal." Aye some dragons have had fur and aye some dragons have had feathers. But this is crazy. All sorts of different colors, patterns, fur, scales, leather, feathers, antlers, and fox like furry ears? This is the image that comes to mind when I read all that. I guess I did go a bit too far, hehe.. I can change these things since Fractera's appearance isn't too important to her character. It can be more like "A slender light blue fur dragon with two long slightly curved horns. She has a thin layer of fur and teal belly scales. At the tip of her tail is Dark blue feathers. Her wings are quite large with a dark blue webbing". I hope I can keep the fur and feather-tail thing, I just think it makes her design more unique. When you're done, make sure you list every change you've made so it can be reviewed. Or you can put the changes in bold or in a different colored font to make them easier to find. Poison is an EarthWing ability. Okay, i'll remove that. But what about an ice blast ability (like a beam of light, but instead it's ice)? It is very powerful and can usually be used once every I guess 6-8 posts? It has a large radius as well. Yes, an ice beam is okay. Just explain what this ice blast is and what it does, etc. Well, this ice beam is exactly like a blast of fire (like a Dragon breathing fire); instead it's ice, and much more powerful and fast. When used, it has a mild knockback on the user. The residue of ice sticks to the ground for a short while until it melts. How fast does the beam travel? Had to look up how many mph 80kph is. It's fine. Ah, you know how you explained to me what your ice blast is/does, how fast it travels? You need to put that into the app.